The innovative chef David Burke has 11 restaurants, stretching from Manhattan to Aspen. His playful yet polished cuisine has long featured memorable dishes, from Angry Lobster to Chocolate Burke’In Bag (a molded chocolate bag filled with mousse) to our latest fancy, Bacon On A Clothesline. Unlike many of his dishes, you can make your own Bacon On A Clothesline. It was all the rage at one of our recent parties, hanging on a string stretched between poles next to the bar. Get your drink, unpin a crisp slice of bacon and enjoy! 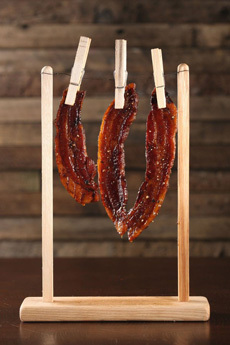 Bacon On A Clothesline was created for Chef Burke’s latest restaurant, Fabrick. The menu also features a revolving choice of dishes such as Octopus Tacos, Baked Pork Shoulder with “Angry” Garlic, Skate “Chop,” Avocado Panna Cotta, Chicken Mousse with Crisped Chicken Skin and “Sticks On A Salt Brick”—skewers of duck parts on a slab of pink Himalayan salt. David Burke Fabrick is on the ground floor of the newly renovated garment district hotel, the Archer Hotel, a boutique hotel that also houses a Burke Group rooftop lounge, Spyglass, with skyline views. There’s also and a California-style aerie at the entrance to the hotel, where you can have a cocktail and people watch. Fabrick is located between Fifth and Sixth Avenues, at 47 West 38th Street, Manhattan; 212-302-3838. The website: DavidBurkeFabrick.com.